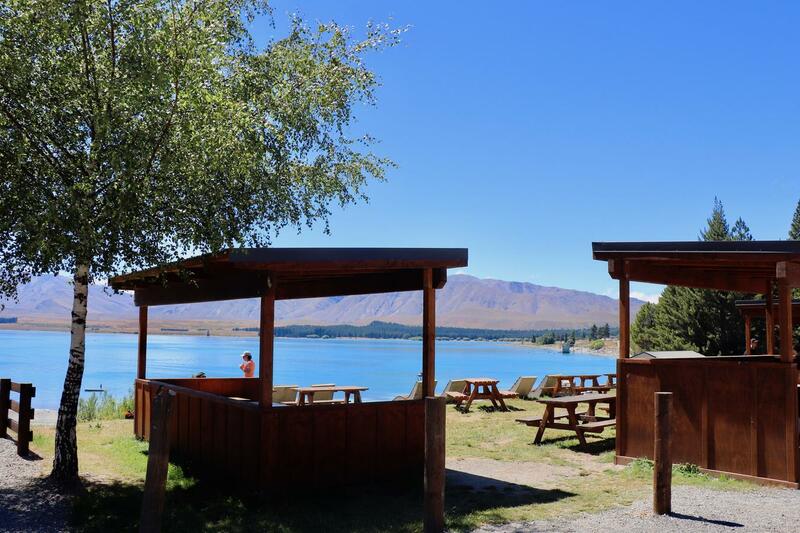 Lake Tekapo Motel Holiday Park and Lakefront Lodge Backpackers is set among mature trees on the picturesque shores of Lake Tekapo. Our alpine location offers endless views of the turquoise lake and the surrounding mountains stunning. Our holiday park hosts all the basics you need for camping or staying in your motor home or caravan. Laundry, kitchens, toilets, showers (on a 6 minute timer) playground etc and of course a fantastic views. We have heaps of free BBQ's dotted around the camp and also close to our accommodation units. This studio motel has a queen bed situated in the main living/TV area and a separate kitchenette area for cooking. There are 2x hot plates and an electric fry pan for cooking. A small dining table with lounge chairs sits in this area as well. You walk through the kitchenette to access a separate bathroom. Complimentary tea, coffee & milk and Sky TV is provided. Free 100MB Wi-Fi per person. 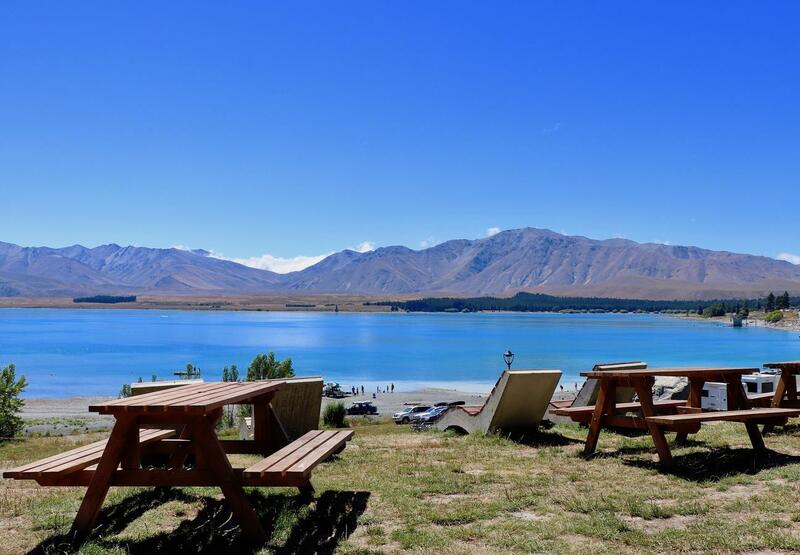 This unit is serviced daily and has great views of the picturesque Lake Tekapo. Please note that the price is based on 2 guests. Maximum occupancy is 2, including infants/children. There is no capability for extra people in this unit. 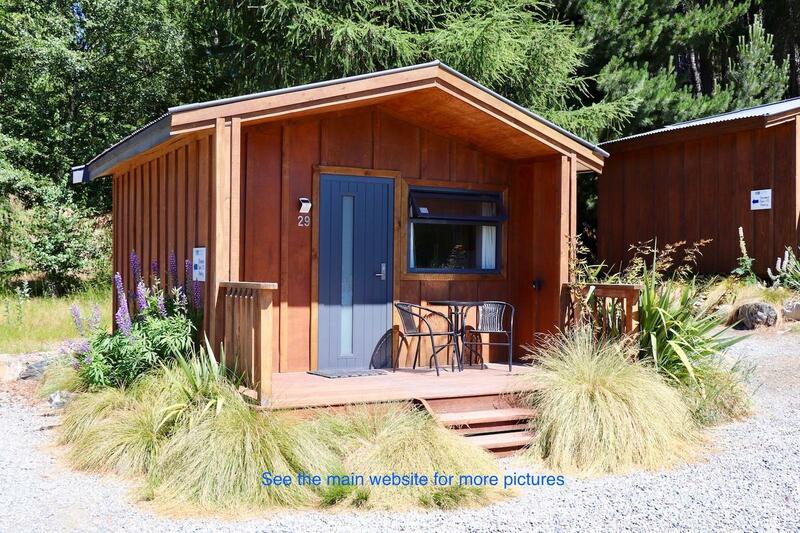 This stand alone two bedroom has a queen bed in one bedroom and three single beds in the other bedroom. It has a good size kitchen that comes with a full oven and the lounge/dining area has plenty of comfortable seating. A separate bathroom finishes of this two bedroom motel with complimentary tea, coffee, milk and Sky TV provided. Free 100MB Wi-Fi per person. 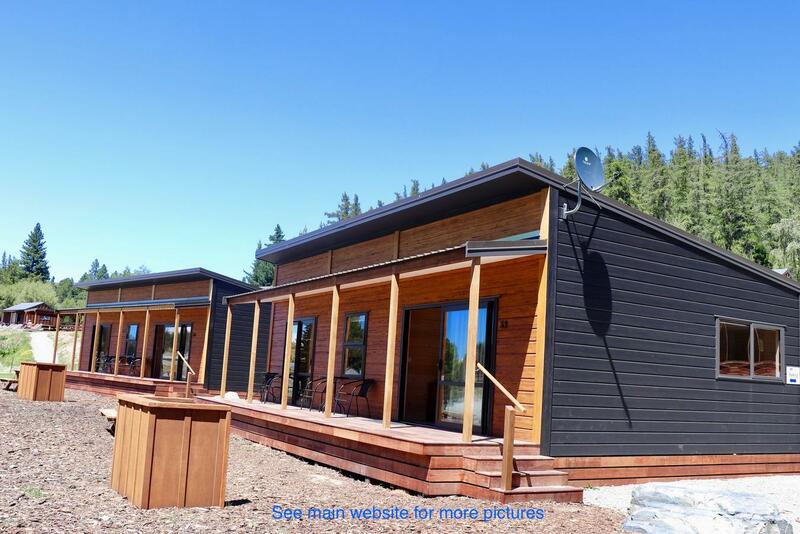 This unit is serviced daily and has great views of the picturesque Lake Tekapo. Please note that the price is based on 2 guests. Maximum occupancy is 5, including infants/children. There is no capability for extra people in this unit. As part of the original camp this stand alone two bedroom unit has all the trimmings of a good old kiwi bach. There is a queen bed in one bedroom and a set of single bunks and a single bed in the other bedroom. 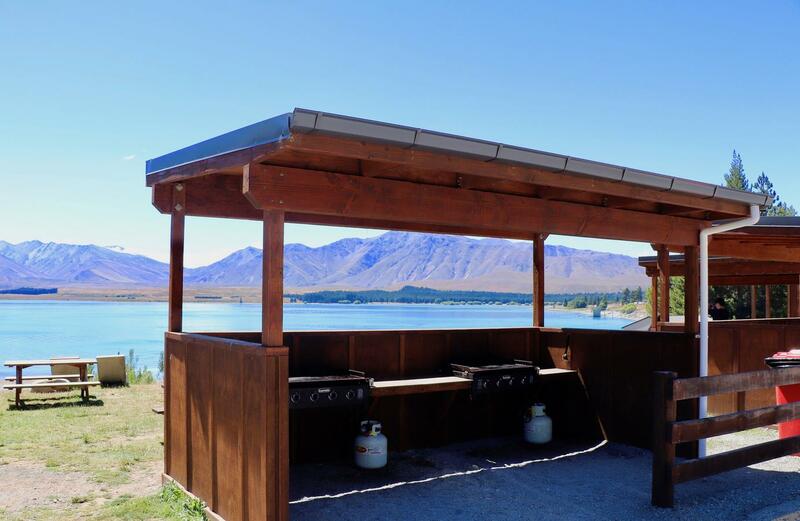 The kitchen area is small but comes with a microwave, 2x hot plates and an electric fry pan and complimentary tea, coffee and milk.The living/lounge area has great views of the picturesque Lake Tekapo and a deck outside facing the lake tops off those long summer days. There is a separate bathroom inside with a shower and basin but the toilet is accessed from the back door, so just a wee step or two outside to the toilet.This unit is serviced daily. Free 100MB Wi-Fi per person. As part of the original camp this stand alone one bedroom unit has all the trimmings of a good old kiwi bach. There is a queen bed and a set of single bunks in the bedroom. The kitchen area is small but comes with a microwave, 2x hot plates and an electric fry pan and complimentary tea, coffee, milk. 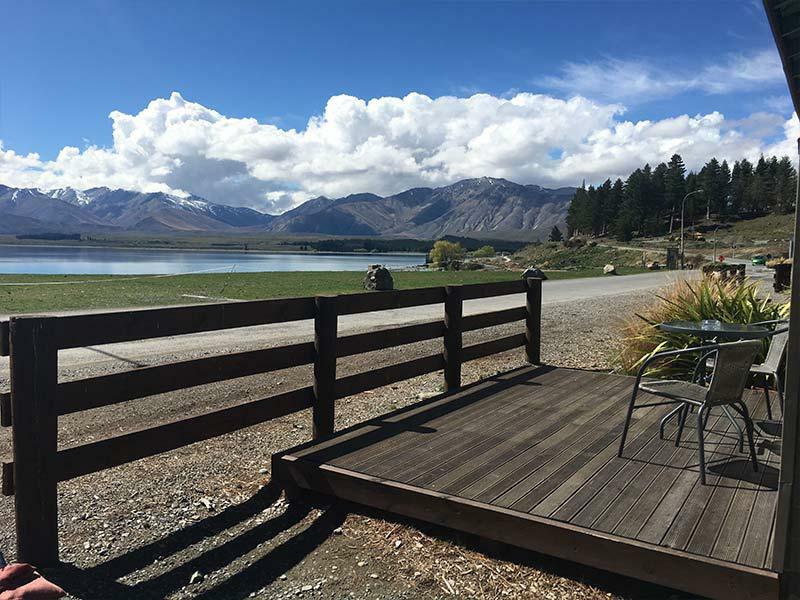 The living/lounge area has great views of the picturesque Lake Tekapo and a deck outside facing the lake tops off those long summer days. There is a separate bathroom inside with a shower and basin but the toilet is accessed from the back door, so just a wee step or two outside to the toilet. This unit is serviced daily. Free 100MB Wi-Fi per person. Please note that the price is based on 2 guests. Maximum occupancy is 4, including infants/children. There is no capability for extra people in this unit. This stand alone ensuite unit has a queen bed and a set of single bunks in the living/lounge area. There is a small kitchenette area suitable for making a cuppa or breakfast and we offer you complimentary tea, coffee, milk on arrival. A microwave is provide for basic cooking but if you require full cooking facilities these are in the main camp kitchen just a few metres away. The kitchenette is supplied with pots, pans to use in the camp kitchen etc. There is a separate bathroom. 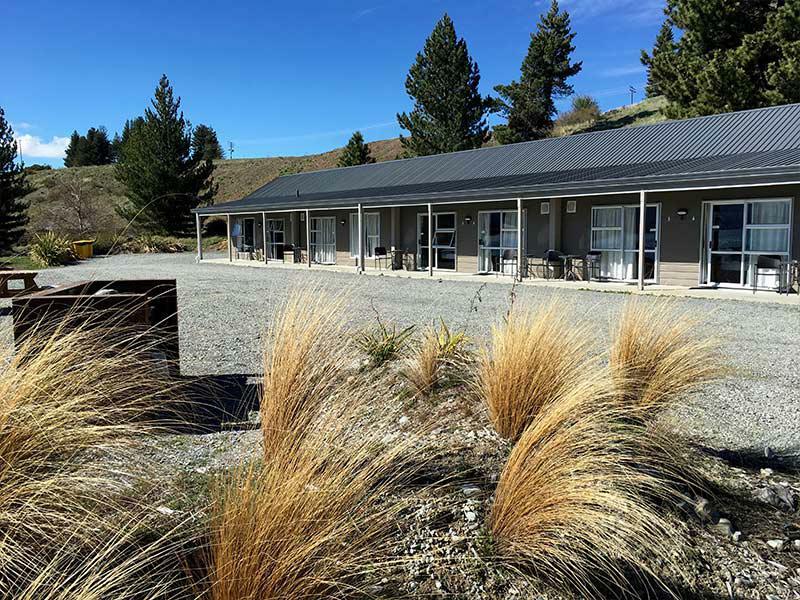 The unit has free to air TV and view of Lake Tekapo and the surrounding hills. This unit is serviced daily. Free 100MB Wi-Fi per person. This stand alone cabin is a one room cabin for sleeping only. It has a queen bed and two sets of single bunks. Basic cutlery, crockery, pots, fry pan, tea towel, dish cloth and an electric jug is provided. Sheets, duvets, blankets and towels are provided for each bed. 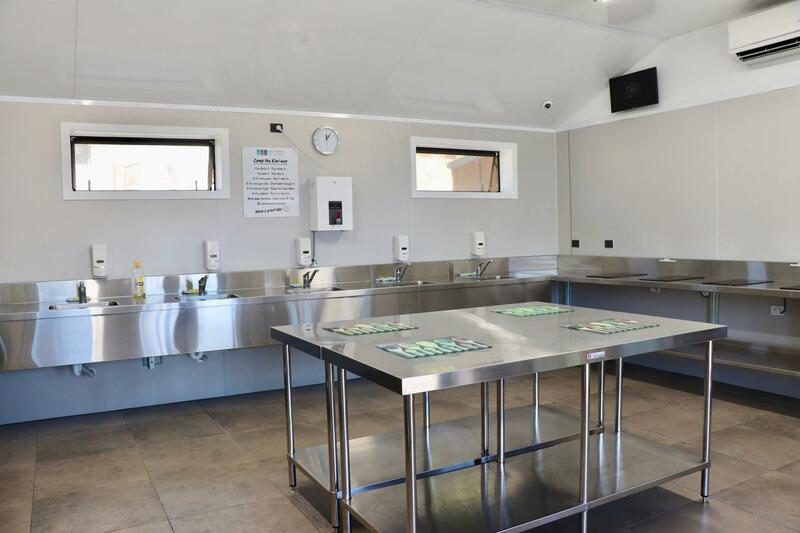 You use the camp kitchen, toilets and showers and the camp showers are operated on a 6 minute timer. You use the camp kitchen, toilets and showers. With a nice deck outside there is room for sitting outside and enjoying the alpine environment. Free 100MB Wi-Fi per person. Please note that the price is based on 2 guests. Maximum occupancy is 6, including infants/children. There is no capability for extra people in this unit. This spacious belle tent has five single beds all made with your sheets and blankets and towels are available from reception if you need them. Basic cutlery, crockery, pots, fry pans and tea towel are provided and you use the camp kitchen, toilets and showers. Showers are operated on a 6 minute timer. With seating outside you can enjoy the alpine environment or chat to your fellow glampers. This tent is hired for your use only and not shared with other people. This glamping tent is hooked into the power so you can charge your phones and you have electric lamps for lighting. We have a range of Wi-Fi options available for purchase from reception or with your credit card. Up to five devices at a time.There is no cooking or heating in this tent. This spacious belle tent has a queen bed and three single beds all made up with your sheets and blankets. You need to bring your own towels or you can hire them at $2.00 per towel from reception. Basic cutlery, crockery, pots, fry pans and tea towel are provided. You use the camp kitchen, toilets and showers. Showers are operated on a 6 minute timer. With seating of seating outside you can enjoy the alpine environment or chat to your fellow glampers. This tent is hired for your use only and not shared with other people. This glamping tent is hooked into the power so you can charge your phones and you have electric lamps for lighting.We have a range of Wi-Fi options available for purchase from reception or with your credit card. Up to five devices at a time.There is NO COOKING in this tent. These powered Lakeview sites are on the front row of the camp with some of the most beautiful views of the lake. 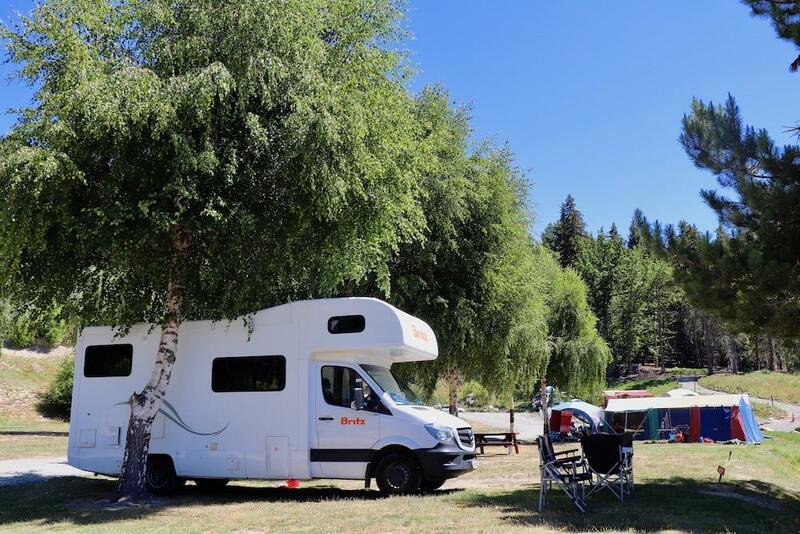 Site 30 has the best view and as we move further down the row to site 19 the views of the lake become filtered by the trees on the lake shore but the beauty of these sites is that no other campervan is going to park in front of you. These sites are elevated so you can look down on what's happening below or across to the lake in front of you. These sites are sealed so perfect for the campervan or caravan (if you wish to put your awning up you will need to look at either a shingle or a grass site) these sites are not suitable for tents either. 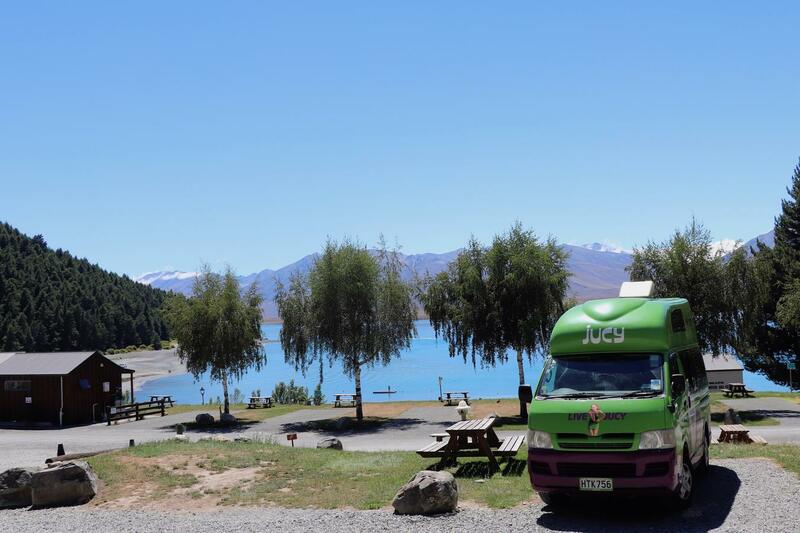 Here at Lake Tekapo we offer three types of powered sites. These are sealed Lakeview, shingle and grass sites. Our Lakeview sites (30 - 19) are along the front row and are sealed, the view changes to a more filtered view as you move down the row to site 19 (see booking chart for rates as there is an additional charge for these). Our shingle sites are suitable for camper vans, motor homes, caravan, cars etc. Some have better views than others and at different elevations. Our grass sites are suitable for tents but you can also put camper vans, motor homes, caravans and cars on these sites. Please note that this small grass power site you have selected is NOT suitable for the big 7M camper-vans or a caravan. These are for small vans, cars and tents only requiring power. Our Lakeview sites (30 - 19) are along the front row and are sealed, the view changes to a more filtered view as you move down the row to site 19 (see booking chart for rates as there is an additional charge for these). The beauty of these sites is that no one can park in front of you, they are not suitable for tents or caravan with awnings. 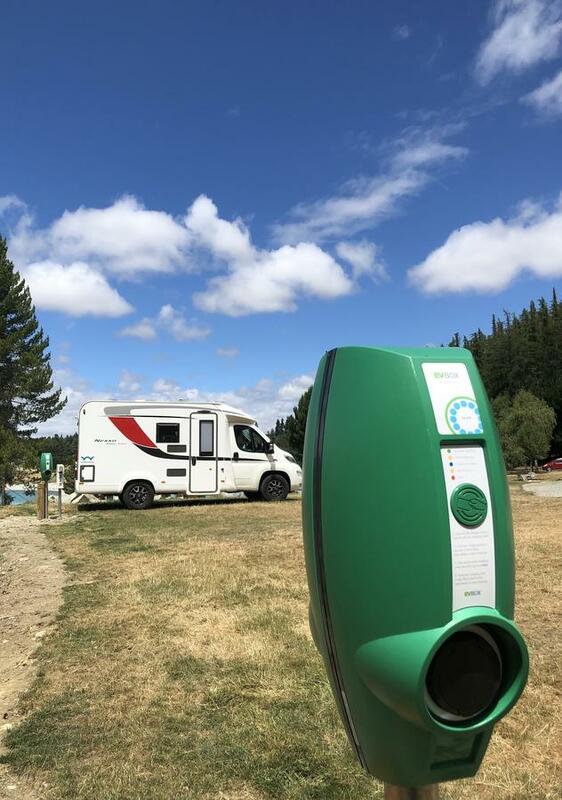 This site is a grass powered site with EV (Electric Vehicle) compatibility so if you are travelling in an Electric Vehicle then this is the site you need to book so you can charge your vehicle. There is an additional cost of $15.00 per night to cover the cost of charging of your vehicle on site. 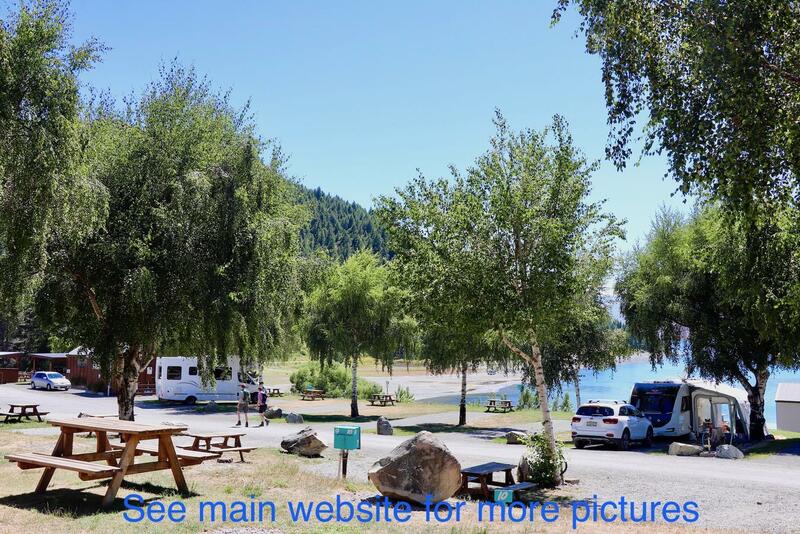 If you are unsure if this is the correct site for you then please contact reception on 0800853853 or email us info@laketekapo-accommodation.co.nz. These sites are currently on request so we will need to confirm availability. NOTE - if selecting this Small Grass Power Site please be aware that they are not suitable for the large 7M camper-vans or caravans. Please select another type of power site. 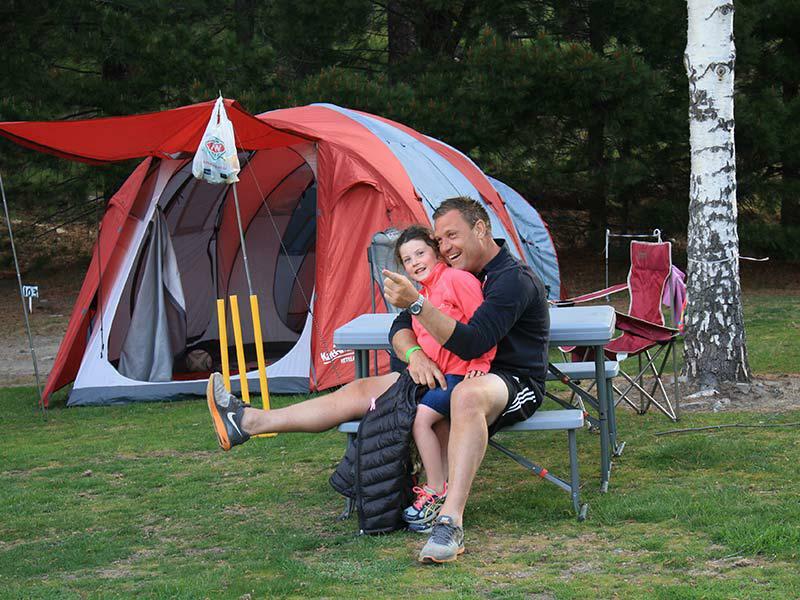 We offer a range of tent site sizes, many of which have great lake views. They range from sites for pup tents, up to sites with enough room for a family tent, car & boat. On booking please let us know your requirements so we can ensure we allocate you the right size site to suit your needs. Our camp kitchens are supplied with ovens, cook tops, microwaves, fridges and freezers, however we don't have pots, pans & plates etc in them. Please bring these along with you. Over our busy period if you cannot fit your boat & car on to your site then it may have to be stored elsewhere. Please ensure you have a suitable locking system if this is the case. We have a range of Wi-Fi options available for purchase from reception or with your credit card. Up to five devices at a time. This site is for the traveler who is working their way around New Zealand WITHOUT a vehicle. These sites are small and suitable for the tent that fits in your backpack. These sites are currently on request so we will need to confirm that this site meets your needs. So if you are hitchhiking, cycling, walking the Te Araroa trail or starting your Alps2Ocean experience then these are the sites for you. We don't provide pots, plates and cutlery etc in the facilities but we have these you can borrow, so ask at reception on arrival. There is no charge for these but we do take $20.00 bond that is refunded on the return of the washed and dried equipment. These Lakeview Glamping tents are set up for the adventurous couple. They are pitched up high on the hill amongst the trees overlooking the lake and the holiday park. A short walk down the hill will bring you to a toilet and shower block and if you wish to use the main holiday park facilities then you will need to walk a bit further to access the kitchen, laundry, and more toilet and showers. There is no vehicle access to these tents so you park your car in the allocated car park and walk up to your tent. Due to the location there is no Wi-Fi access either. All bedding and all plates, cutlery, pots, pan, utensils and tea towel and dish cloth is provided as well for use in the main kitchen block. You just need to bring your own towels or hire them @ $2.00 each. There is a BBQ area set up for your use as well. So if you want a tent for two, away from the rest of the camp with views of the lake and stars then one of these five glamping tents is for you. 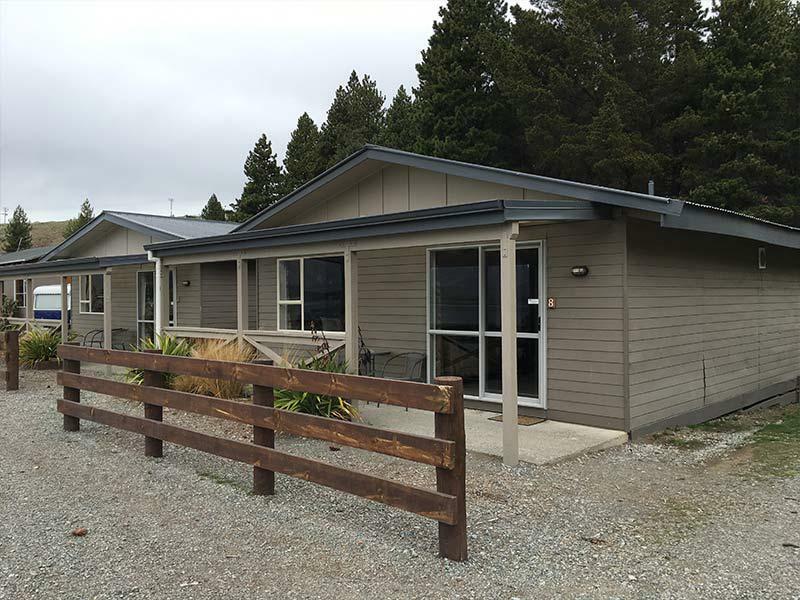 These three bedroom modern new Lockwood Kiwi Baches have been especially designed with the large family in mind. With full cooking this is perfect for the traveler wanting to be self contained and independent. With a deck running the width of the unit you can sit outside and enjoy the view and watch the world go by. One bedroom has a queen bed, one has two sets of single bunks and the other small bedroom has one single bunk sleeping a max of 8 people (including babies and infants). The kitchen has an oven, microwave and a decent size fridge/freezer and with your own BBQ outside what more could you ask for. All linen, towels and bedding is provided with parking for two vehicles by your unit. The nightly tariff is for four people and you pay for each child or adult after that up to a max of 8 (including babies and infants). Turn off Highway 8 into Lakeside Drive and you will see our reception on your left about 500 meters down the road. 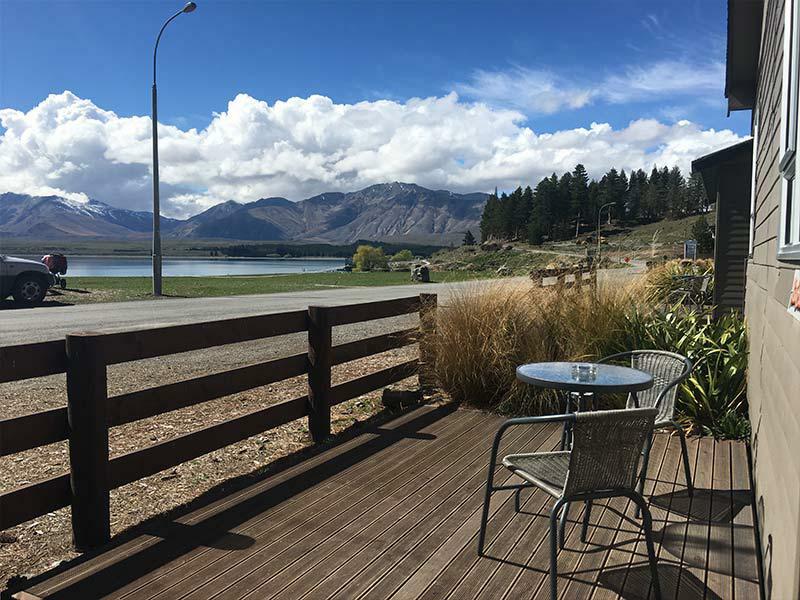 We are located across the road from the beautiful Lake Tekapo. 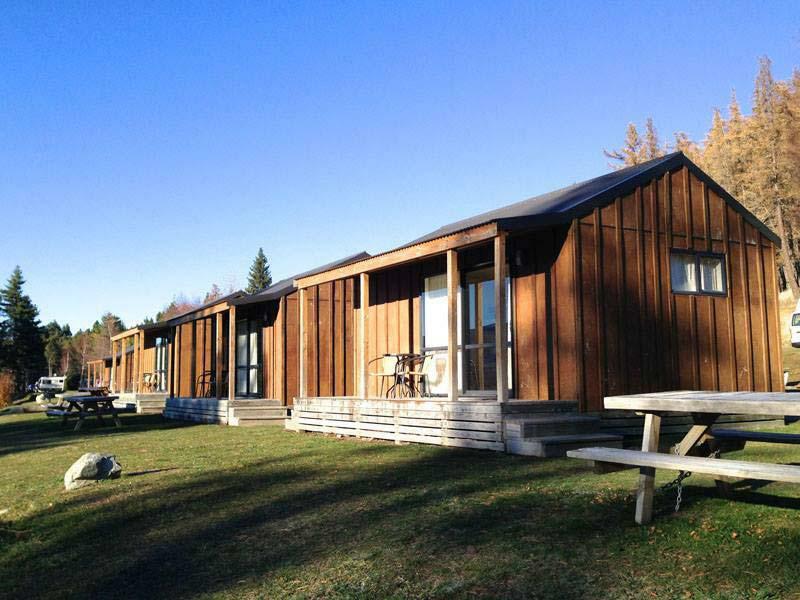 We are about 500m from Tekapo Springs and 1km from the town village. Just a little further down the road is the famous Church of the Good Shepherd. Being a small town everything is within walking distance if you want to stretch your legs. Xmas/New Year - we are a family camp so admittance is at the discretion of management, we don't allow large groups of teens or unaccompanied minors. Please check with reception to avoid disappointment. Your browser does not support frames, so to continue with your enquiry please click here to open enquiry page.